The story of Alice in Wonderland is a favorite among many! 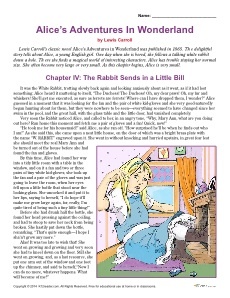 We have included a series of free worksheets to go along with an excerpt from Alice’s Adventures In Wonderland. Included are order of events, synonyms, vocabulary match, main idea, and word scramble. These printable worksheets are a great addition to any classroom.